In the DUFL, the Pitmen U15 and U17 entertained Dnipro-80 Cherkasy, and Shakhtar U14 and U16 played an away game with the Cherkasy side. In the game involving younger teams, the Pitmen managed to seal the fate of the game as early as in the first half. The Pitmen tried to carve the opposition defence open for 20 minutes. A result was brought through Vladislav Kobylyanskyi’s long shot. After three minutes Oleskandr Kurtsev took a powerful shot from outside the penalty area to make a comfortable lead for his team. The opponents did not find strengths to draw level, with Shakhtar keeping to go forward in numbers. As a result, two minutes before the half time break, Leon Gladkovskyy also got on the scoresheet. In the second half, the Pitmen’s coaching staff made a number of changes, and the tempo of the game slowed down a bit. However, it did not prevent the Pitmen from scoring fourth goal. It was netted by Abdula Abdulaev. - We had a decent first half. During the break we made a number of changes, but we failed to motivate the boys for this game after our win over Dynamo Kyiv. Our conversion of chances let us down; the fatigue was felt. Overall, it was a useful game; moreover, it took place on the natural pitch. We will analyse our errors and will prepare for the match with UFK Dnipro. In the older group, the Pitmen dominated proceedings during the whole game. Gennadiy Zubov’s charges energetically went forward, forcing the opponents to sit in defence. It did not take long for the Pitmen to carve the opposition defence open. In the ninth minute, Vadim Bilokur headed in a cross from a corner. Shakhtarcontinued piling on pressure to extend the lead, but the Pitmen could not find the target. The game saw more goals in the second half. In the 55 minute, Bohdan Pribluda received a pass from Pavlo Koryakin to send the ball in. After 12 minutes, Maksym Maksymenko made it 3-0, and Bilokur wrapped the game up with a header. - Today was a great atmosphere, we were received well, - Shakhtar U16 head coach Gennadiy Zubov reflected on the game. – We played at the stadium, where First League games take place. Indeed, we had to adapt to a natural turf, as we train on the synthetics, - the ball bounces differently there. I think we should have scored more, we had chances for that. But overall we completed the main task – we took three points. During theory sessions, we will analyse our errors. 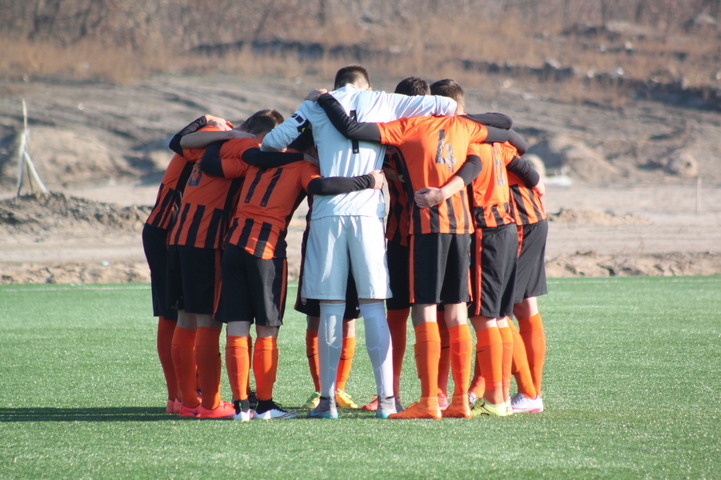 In the match with Dnipro-80 U15 Shakhtar faced the opponents’ tight defence. The visitors tried to close down all free zones in defence, without paying attention to their own attacks. However, as early as on 13 minutes, the Pitmen found the way to take the lead. Roman Bodnya opened the scoring with a powerful shot from distance. After nine minutes, the Pitmen extended their lead. Alan Aussi joined the attack to slot a Stanislav Biblik cross home inside the penalty area. In the second half, Shakhtar kept piling on pressure. On 39 minutes, after a cross from a corner Dmytro Kharchenko scored a goal. Before the end of the game, the Pitmen managed to spring another successful attacking move, which led to a goal from Serhiy Snisar. On 68 minutes, Dnipro-80 defender brought Oleksiy Sidorov inside the penalty area. Mykyta Kabrel converted a penalty kick. - Despite great dominance in terms of score, the match was not easy, - Shakhtar U15 head coach Oleksandr Ladeyko has reflected on the game. – It is hard to carve open the opposition packed defence. In such a situation individual actions and long range shots come to the forefront. It was interesting to see, how the boys would adjust to such a game. I think they succeeded. The Pitmen’s older team managed to open the scoring quite quickly. As early as on 7 minutes, Oleg Vakulenko bore down on goal to send the ball in after a pass from Andriy Kravchuk. After a minute, Vakulenko again found a good position to send the ball into the corner of the net. Dnipro-80 played defensive football, without chances to create something upfront, and Valeriy Rudakov’s charges continued cementing the lead. Before the half time break, goals were scored by Valeriy Gayvan, Andriy Kravchuk and Maksym Andruschenko – 5-0. In the beginning of the second half the situation on the pitch got worse for the opponents. The opposition defender was sent off for handball inside the penalty area. But Vladislav Kuzmenko failed to convert a penalty kick – the goalkeeper made a save. But the Pitmen kept on scoring. The Pitmen went on to score six more goals against Dnipro-80. Vladislav Kuzmenko sealed his brace, two more goals were netted by Andriy Kravchuk and Dmytro Bodnaruk and Yuhym Konoplya added one goal. - Our opponents are sitting bottom of the table, so we were expecting a high-scoring game, - Shakhtar U17 head coach Valeriy Rudakov has reflected on the game. – Moreover, our main rivals Dynamo and Dnipro confidently won in the game with this team. We created many goal scoring chances, combined well, we could have scored more goals. We would like to see better conversion of chances from forwards, but overall they boys did well. We are also pleased with keeping a clean sheet.